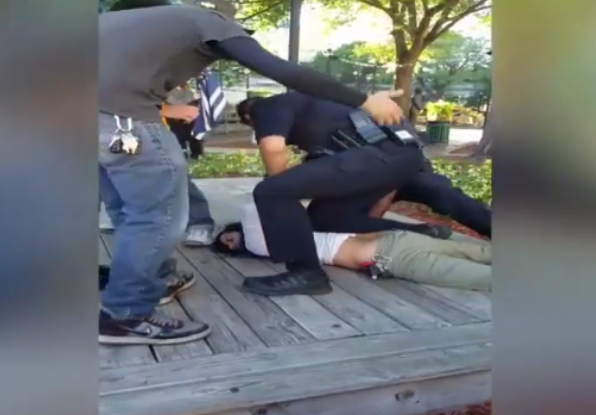 JSO officers arrested five protesters Friday evening in Hemming Park. The arrests were captured on cell phone video. Jacksonville attorney John Phillips said he’s conducting a review of what happened during a Hemming Park protest Friday as he prepares to represent at least one of those arrested. Several protesters were arrested during a demonstration against last week’s U.S. airstrikes in Syria. Philips said he’s reviewing all available evidence of what led to the arrests. As widely circulated videos show, chaos broke out between protesters, one counter-protester and police. Five protesters were arrested on felony charges, including inciting a riot, resisting arrest and battery on an officer. 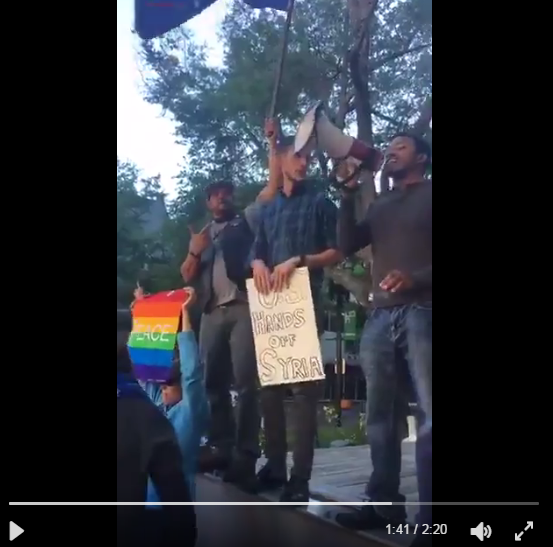 One shaky video showed what looks like the start of the scuffle with police when a counter-protester, who said his name is Gary Snow, gives a middle finger to protester Connell Crooms. When Crooms appears to lunge toward Snow, police took Crooms down. Snow said protesters were taking his belongings. Snow was not arrested, and police said Crooms was the violent aggressor. A video showed several officers trying to arrest Crooms, who was hospitalized. Some observers are outraged, including his mother, Felicia Crooms saying it was brutality because he’s deaf. They said he couldn’t hear police commands. Wells Todd with the Progressive Coalition, one of the groups who led the protest, said he’s considering a lawsuit against JSO. “We’re holding Sheriff Williams and the police department here responsible for what happened and we’re asking for a public apology and we’re asking the city to pay for damages,” Todd said. Other videos show Snow, prior to the incident, with a large Donald Trump flag yelling over protesters and getting on stage with them. Protesters asked police to remove him from the stage, but they did not. Counter-protester Gary Snow and protesters David Schneider and Connell Crooms who were arrested, stand on stage at Hemming Park. Snow regularly counter-protests events seen as anti-Trump or anti-police, he said in a Facebook video. There’s also a video online of Snow burning and shooting a Pan-African flag. He said in a Facebook video he did it in response to groups burning the American flag. He denies he was trying to incite a riot, as protesters claimed. Jacksonville Sheriff Mike Williams said in an emailed statement officers don’t tell groups where to stand during protests. “As per protest planning protocol, we don’t tell groups where to go, but we do tell them what they can and cannot lawfully do — and specifically what actions may result in arrest,” he said. He said protesters are encouraged to respond to agitators in a calm demeanor and must refrain from physical violence. However, he said the incident has prompted him to look into how JSO manages protests. “I am working with my leadership team to determine what new protocols may be put into place to successfully manage these events moving forward,” Williams said. Six people were arrested Friday when a protest downtown against the U.S. firing missiles at a Syrian airbase turned violent. Video of the Jacksonville Sheriff’s officers taking protestors to the ground has been shared around the world, including London’s Daily Mail. 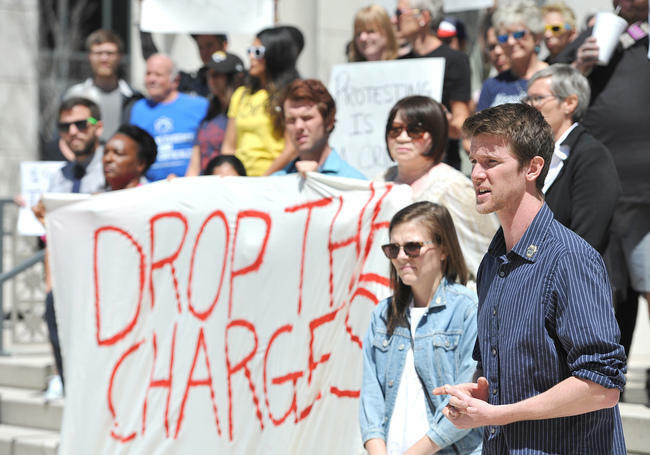 On Saturday, protesters gathered in front of the Duval County Courthouse demanding the charges against those arrested be dropped. 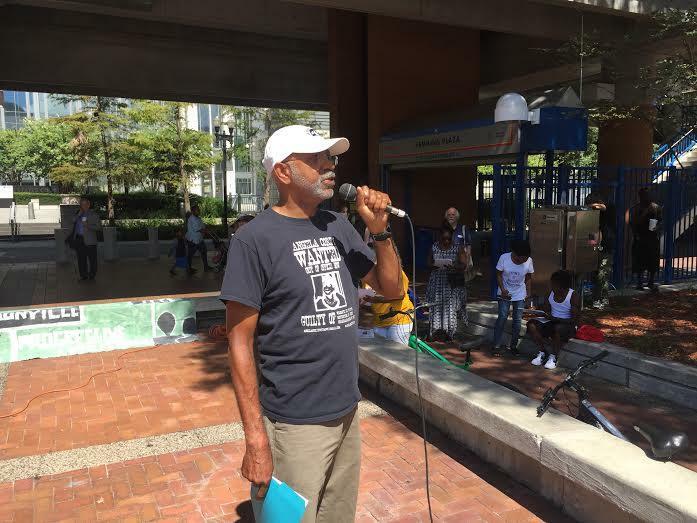 The Jacksonville Progressive Coalition led a protest in Hemming Park Friday against the policies of Republican State Attorney Angela Corey. Hundreds of people protested Tuesday in front of the Duval County Courthouse before marching to City Hall. The “no human is illegal” protesters rallied against President Trump’s order to temporarily ban travel from seven Muslim-majority countries.